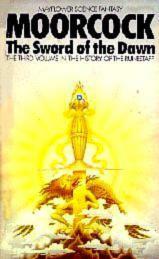 The Sword of the Dawn is the third in Michael Moorcock's four-part series "The History of the Runestaff" starring Dorian Hawkmoon. Castle Brass was transported to another dimension by the gift of the Soryandum. Without its heroes, however, Granbretan has conquered all of Europe. Those of Castle Brass, though living in their peaceful haven, cannot help but wonder about the fate of the world left behind. A playwright of Granbretan, Elvereza Tozer, mysteriously appears in the countryside. He explains that he followed them into the alternate Kamarg by means of a crystal obtain by a hermit in the mountains of Yel. Fearful that the tenacious Meliadus and the others will do likewise, Hawkmoon and the heroes of Castle Brass decide that the safest course is for them to find the hermit and his crystals before the Granbretanians do. Meanwhile, King-Emperor Huon does not agree with Meliadus's obsession with taking vengeance on Hawkmoon and Castle Brass. Thus, Meliadus begins building alliances within the power structure of the Dark Empire that he hopes will allow him to circumvent Huon. Baron Kalan and Taragrom, Master of the Palace of Time, are of particular interest to Meliadus since he believes their experiments will lead to the discovery of how to reach Castle Brass. In disguise, Hawkmoon and D'Averc return to the capital of Granbretan, Londra, to learn whether the Granbretanians have yet discovered the cave of Mygan, the hermit of Yel. Finding they have not, the pair leave Londra in the hopes of reaching Mygan first. Pursued again by the determined Meliadus, their only means of escape is to use Mygan's crystals to transport themselves out of the mountains. Landing in the unfamiliar land of Amarekh, Mygan reveals that he is aware of the Runestaff's connection with Hawkmoon. He advises them to, in order, seek the city of Narleen, the Sword of the Dawn, and the city of Dnark. Thus, before they can hope to return home, Hawkmoon and D'Averc must master the strange contraptions of the Charki, contend with slavers, and fight an entire city of Creole pirates. This third volume of The History of the Runestaff is the most-pulsing pounding as Hawkmoon and D'Averc are whirled from one battle to the next as they desperately try to save Castle Brass from the plotting of the Dark Empire. Some of the settings and mechanics of Hawkmoon's world are so different from standard sword and sorcery pseudo-medieval fare that, at times, the series reads like sword and planet. Once again, Hawkmoon is up-staged by more likeable, witty, and clever companions (especially D'Averc). Further, unlike many fantasy heroes, Hawkmoon does not significantly grow in power or personality; Hawkmoon's gains fall into the category of "easy come, easy go." Still, there's much more here than Hawkmoon himself... there're crazed barons, immortal kings, magical devices, brave and loyal friends, creepy monsters... and pirates, pirates, and more pirates! It's frankly hard to believe that Moorcock could coherently pack so much action into so few pages. A thrill-a-minute book for pulp fans only, I rate this an 8 out of 10.